How common is syncope in cervical spondylosis ? Dizzines , giddiness , light headedness , fear of fall or true fall (Syncope) are the most common symptoms beyond middle age .They usually end up with consulting physicians , neurologists and cardiologists .Cervical disc is commonly blamed for this.While all these symptoms can be a manifestation of cervical disc , true syncope seems to be rare with cervical spinal disorder. 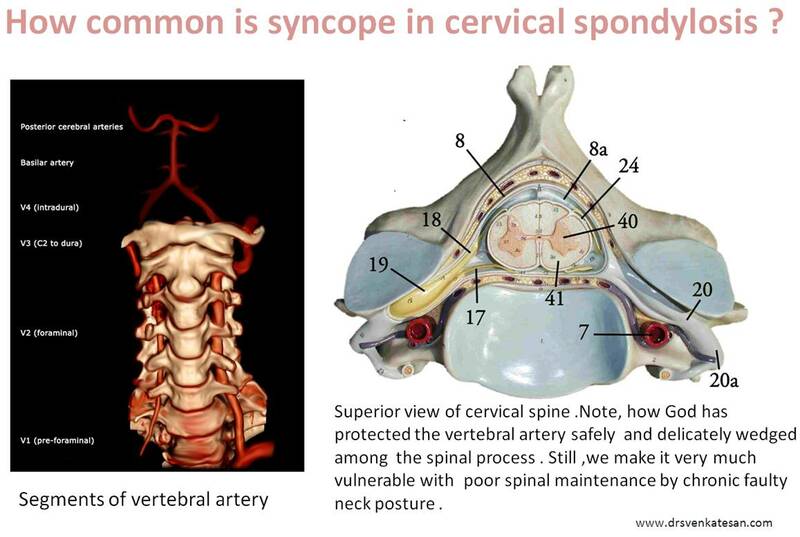 Why true is syncope rare with cervical spinal narrowing ? There is a fundamental ignorance here. We are not yet clear whether giddiness /dizziness is neural or vascular . (Or combinations of both ) in cervical spinal disease. Many of the patients experience momentary unsteadiness and feel like falling but very rarely end up in a fall or syncope.By definition syncope requires global transient hypoperfusion of brain to trigger a fall . Cervical canal carries only the vertebral artery .Both internal carotids are no where near the spine. So, however severe the vascular compromise within the cervical canal , syncope is unlikely as anterior cerebral circulation compensates at the level of circle of Willis. Is that the correct way of reasoning ? Unilateral vertebral compromise rarely matters as other side takes care.It is very unlikely both vertebral artery get compromised by cervical spinal spurs simultaneously. How many seconds of vascular compromise is required to produce syncope ? Brain seems to be a funny and sensitive organ .In erect posture it is very sensitive. It reacts in a fraction of time for any transient reduction of blood flow.The same cardiac events which can cause symptoms of impending syncope in erect posture is quiet comfortably tackled in recumbent posture . In erect posture , blood pressure need to much higher to get it pumped above the heart against the gravity. Though , it seems absolute blood pressure and cerebral perfusion that matters, there is something more we are missing. The brain-stem -vestibular system perceives differently when a recumbent person develop cerebral ischemia than when he is erect . The reflex circuit that activates on/off switch for abrubt loss generalised muscular tone is not yet been identified . We think more than 3 second pause will initiate a syncope circuit .But it is not a fixed number. Some can tolerate up to 5sec or even more especially in lying posture. Syncope , as such in isolated cervical spondylosis is rare even though it can potentially interfere with the vertebro basilar system .Why the vascular compromise almost always fall short of syncope and end up with just momentry unsteadiness is not clear. Is dizziness, giddiness , presyncope are vascular or neural event? Can vertigo occur with cervival spine disease ? Fatty meals and sticky platelets : A new trigger for ACS ? What about going for a saturday night party doctor? One of my shrewd looking patient who was recently double stented with DES , asked. Human body is a biological marvel.While medical professional divide it into various systems for our convenience. God doesn’t think that way .He has no systems in mind when the body was designed . There is no wonder , the alimentary system and hematological system has to interact on a daily basis with the help of circulatory system to keep the body alive. Platelets are unique blood cells that exist primarily to plug physiological bleeding if any or for self-healing at sites of tissue injury. With human vascular system increasingly invaded by various metals and wires , platelet are a confused lot since their original biological functions are altered. They simply don’t know whether fight these foreign body , aggregate over it , flush or simply pass over these .Adding to this the powerful anti-platelet drugs targeting critical functional pathways .No wonder every other cardiovascular patient consumes at least one anti-platelet drug. With human beings desire to add style to food consumption and eating habits competing with top slot of purpose of living , we often forget it is same prevent us from living a good life. There has been numerous anecdotal and study population and experience acute coronary events are more common after a heavy meal especially a fatty one .The immediate suspect has been high triglyceride and chilomicrons in blood stream shunted intestines . Glycerol component of TGL is know for its sickness and making the companions wet. The million dolor question is , at what level of TGL and which forms of TGL make the platelet cry and attract each other ? Diet, anti platelet drug efficacy ? Now , patients with coronary stents has to live at the mercy of these anti-platelet drugs. The drug resistance(Clopidgrel) is threatening to be major issue.Like warfarin do we have real issue of dietary binge and acute neutralisation of anti-platelet drug efficacy that can trigger acute stent thrombosis . This is potentially important area of study . So does a fatty meal a new trigger for ACS ? It may sound an alarmist statement .but as of now , its difficult to ignore this.So my advice for that the that smart young man with soluble stent was to avoid binge dinners that carries a definite risk of interfering with stent maintenance . 1.Impairment of endothelial function after a high-fat meal in patients with coronary artery disease.Zhao SP1, Liu L, Gao M, Coron Artery Dis. 2001 Nov;12(7):561-5. 3.Brook JG, Herzog E, Aviram M. The acute effects of high cholesterol and saturated fat diet on plasma lipoproteins and on platelet aggregation in normolipidemic subjects. Nutr Rep Intern. 1986;33:129–38. 7.Aznar J, Santos MT, Vallés J. Effect of postprandial lipaemia on platelet function in man evaluated in whole blood. Thromb Res. 1987;48:567–76. Obesity (Silver Spring). 2009 Jul;17(7):1375-80. Admixture lesions in congenital heart disease : “It’s still difficult” to understand isn’t ? ! What are the mechanisms of cyanosis in cyanotic heart disease ? Simple mixing of arterial and venous blood channels within the atria ,ventricle or great vessel without RVOT obstruction .This, in fact can causes increased pulmonary blood flow (Technically left to right shunt ) and still there is cyanosis (These are called as Admixture lesions ) It is also to be noted some of the admixture lesions (Truncus, DORV,etc ) the mixing takes place only during systole , while TAPVC,Common atrium, Tricuspid atresia* admixture is more complete as it happens during entire cardiac cycle. Now, is it possible for “Net” left to right shunt to result in cyanosis ? All pure admixture lesions are in fact net left to right shunts. (TAPVC, Single ventricle , Common atrium , Common AV canal ,Truncus, ) This is the group we have been traditionally calling cyanosis with increased pulmonary flow. Its may also to be noted with surprise some admixture lesions often has less intense cyanosis than other forms as long as pulmonary blood flow is normal and the lung does its job perfectly . *Please note Isolated classical left to right shunts , ASD, VSD, PDA can never cause significant cyanosis unless there is reversal of flow .However ,many Eisenmenger physiology show net Left to right shunting only ( 1.2-1.5 : 1 or so ) but with a definite right to left component .What we call as typically bi-directional shunt . How can cyanosis be minimal even in some cases of single ventricle ? Even though there is single ventricle , there can be preferential (favorable) streaming of right heart blood flow without gross mixing . As discussed before good uninterrupted pulmonary blood flow will make the cyanosis less intense . Is single ventricle with PS admixture lesion or TOF physiology ? Streaming is common in which situations? Inspite of absence of IVS, streaming has been noted in some cases of single ventricle with minimal cyanosis with good saturation in Aorta. Streaming in TAPVC has some unique features. In Supra cardiac TAPVC that drains into SVC or coronary sinus the streaming is unfavorable as it may preferentially cross tricuspid valve and enter PA making the saturation higher than Aorta. Streaming is less common in which lesions ? In common atrium and TAPVC draining into RA streaming is less common.In tricuspid atresia streaming is almost impossible as TV is non existent and this ensures complete mixing in the atria and hence cyanosis is likely to be severe. Can TOF behave like an admixture lesions ? Technically yes.If the RVOT obstruction is minimal ,(What was called then as pink Fallot ) We haven’t understood this entity properly for so long. Atleast I was baffled to read when J.K Perloff mentioned in his book during my DM fellowship days, that TOF can manifest with predominant left to right shunt with little or absent cyanosis. Though admixure lesions are discussed separately , bulk of them actually represent cyanosis with increased pulmonary blood flow situations. Jaganmohan A Tharakan Admixture lesions in congenital cyanotic heart disease Ann Pediatr Cardiol. 2011 Jan-Jun; 4(1): 53–59. Happy new year to all . . .thanks to wordpress for making this possible ! On this special day , wishing all the readers and followers of this blog an energetic, creative , insightful and of-course a happy new year 2016 ! Just wanted to share the 2015 annual report of this site with the readers.